The MV TemuKira liveaboard offers year-round dive trips to Raja Ampat. Trips are usually 10 nights, allowing for in-depth exploration of this diverse region. Trips include stops at notable dive areas Mansuar, Airborek, Fam, Wayag & Misool. Known for stunning scenery above water, below the waves Raja Ampat has so much going on no diver can get bored. With at least 75% of all coral species found here, as well as an abundance in marine life and varied dive sites, a liveaboard trip to Raja Ampat is a 'must' for any diver. Dive facilities include a dive platform with shower, dive tender for drops offs & pickups, on-board compressor station, camera charging and work stations. Catering to just 12 guests, the M/V TemuKira has 6 comfortable double or twin air-conditioned cabins with en-suite bathrooms. Social areas include the sun deck with awning and an air-conditioned lounge with TV & DVD player and dining area where European and Indonesian meals are served. 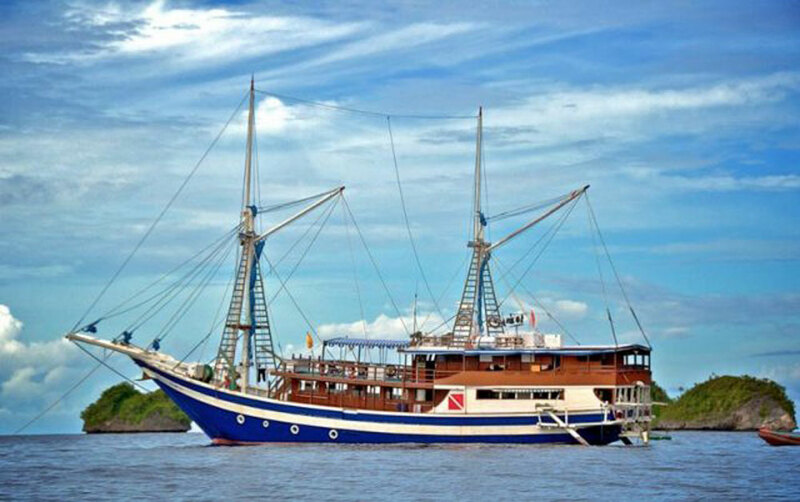 An Indonesian dive liveaboard is a great option aboard the MV TemuKira. Call us or book online today to reserve your space. 6 Air-Conditioned cabins for 12 persons with en-suite bathroom, shower, wash basin and toilet.